The HyperAtlas is a highly sophisticated analytical tool based on the multi-scalar territorial analysis concept. This concept is supporting the assumption that the situation of a given region/territory should take into account its relative situation and localization. 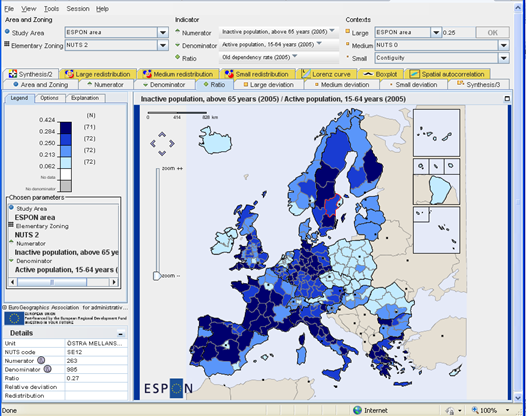 With the HyperAtlas, a local decision maker in a convergence region can, for example, easily compare and analyse its region’s relative position at European, national and local scale for a whole set of criteria, such as GDP/inhabitant, unemployment, accessibility, ageing, etc. 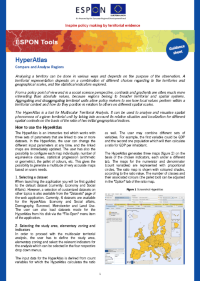 The ESPON HyperAtlas is now available as a web application, making it possible to provide users with the most updated issued version of the software and the most updated data and indicator sets available. A new feature is the possibility to enter an expert mode. This mode gives access to various extra options such as Lorenz curves, box plots and spatial autocorrelation. The ESPON HyperAtlas has been developed within the framework of a service contract Update of the ESPON HyperAtlas, coordinated by the Université Joseph Fourier Grenoble (LIG laboratory) in France. The ESPON Programme grants free access to the ESPON HyperAtlas application upon agreement of the following terms and conditions of use.